Arriving at the Gekkouji train station in Fujiyoshida-Shi – traveling light and heading to our hostel after our train ride from Tokyo. The hotel we were staying at in Tokyo was kind enough to allow us to leave our backpacks behind their desk while we took an overnight trip to Mount Fuji. We were going to return to the same hotel in Tokyo so it really helped us to lighten our load. Our backpacks are becoming a tiring part of our travels so being light going through the subway system is something we see as a gift. 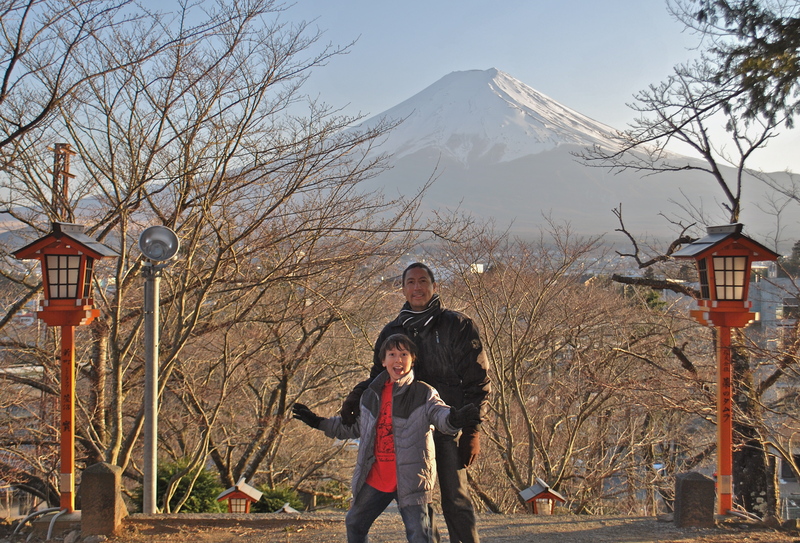 We hopped on a train using our Japan Rail Pass and headed to Fujiyoshida-Shi to visit the beautiful Mount Fuji. Mount Fuji is the highest mountain in Japan, it’s an active stratovolcano that last erupted in 1707. 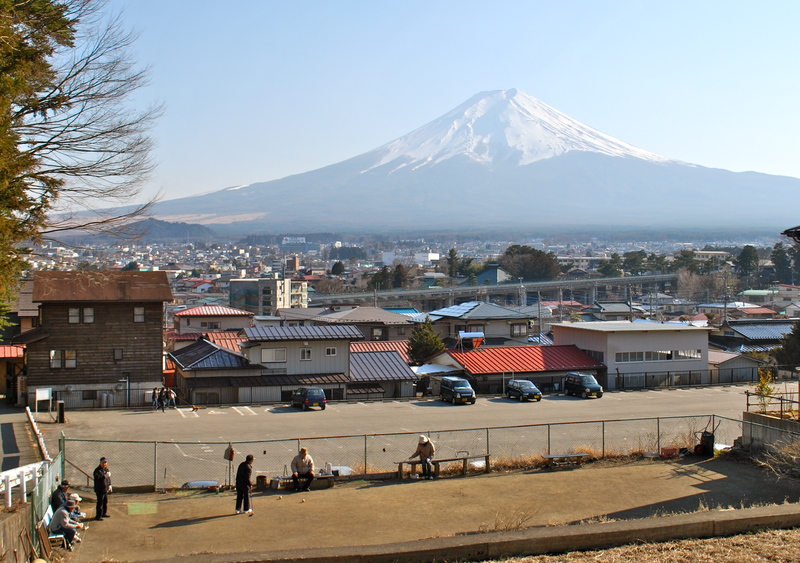 We booked our accommodations at a traditional Japanese style hostel, it was walking distance from the train station and from the window you could see the awesome symmetrical cone shape of the mesmerizing Mount Fuji. We never, ever would have imagined meeting a Green Bay Packer fan on the other side of the world, but we did. Even though Mike is a New Yorker he believes in the nostalgia and legacy of Green Bay Packers. He’s a great guy who not only owned the hostel but also owned the pub below the hostel. That night at Mike’s Pub we talked about everything under the sun – Mike married a Japanese woman after his military career and has been in Japan for 16 years. 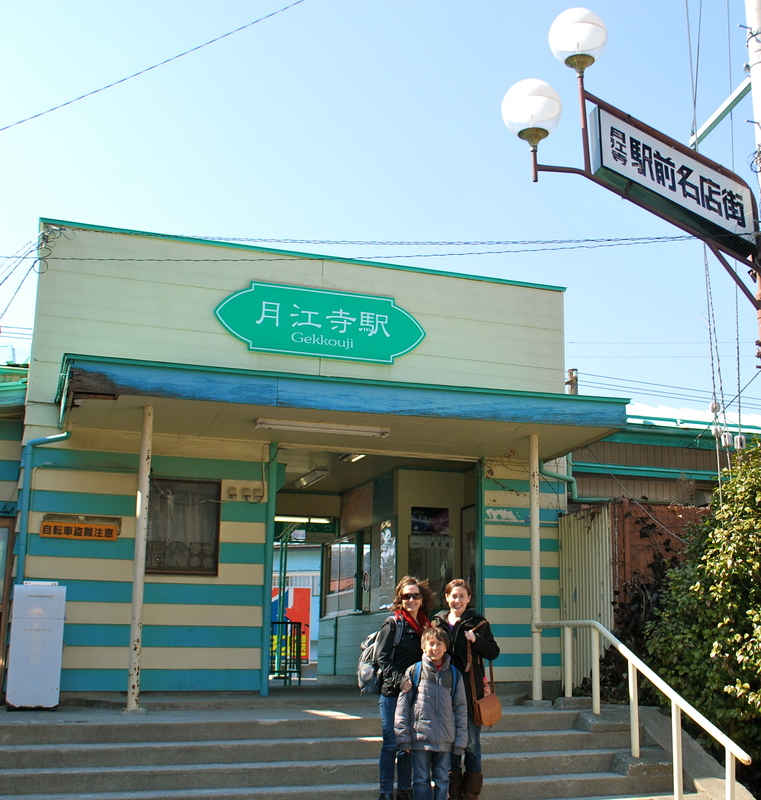 We discussed the fact that even though Mount Fuji is so far south of where the earthquake (that spawned a ferocious tsunami and radiation leak) took place in 2011 that Fujiyoshida-Shi is still hurting from a tourist perspective. They literally lost ten’s of thousands of tourists overnight . . . people just simply cancelled flights and accommodations throughout Japan. It will take a while to rebound but he sees glimpses of that rebound every month. He also talked to us about how the Japanese people have banded together to help one another through this time . . . taking only what they needed for assistance and making sure others had enough. The ethical and moral compass in the Japanese people is strong and well. 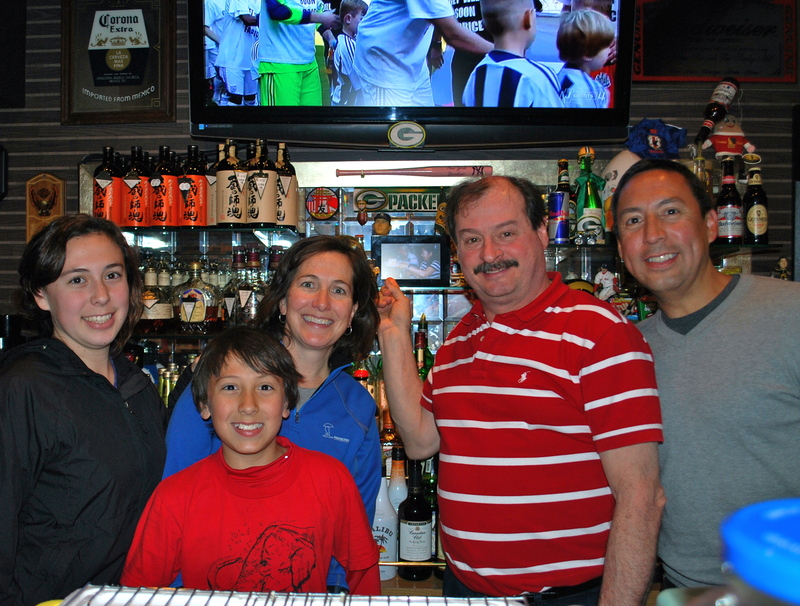 Mike – our Green Bay Packer Fan in Japan! The season for climbing Mount Fuji is July and August. If we were to try “we would surely meet sudden death” as said by Bear Grylls in “Man vs. Wild”. So instead we headed to one of the most picturesque locations in Fujiyoshida-Shi to view Mount Fuji; the Churei-toh Pagoda. 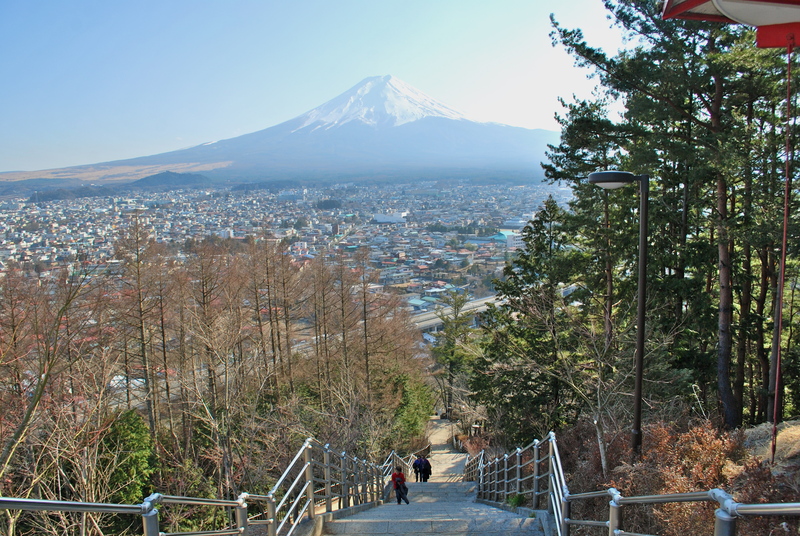 The trek up was very nice, through some Japanese neighborhoods and we seemed to be the only people up there other than a few teenage girls. After we got to the top the kids took off further up into the woods and Amy and I just sat and took in the view. It seemed like forever that the kids were gone and then Amy spotted 2 decent sized monkeys about 3 feet tall. We asked the 3 teenage Japanese girls (in our best sign language/charades) if the monkeys were mean and they fearfully grabbed their snacks and looked around with their eyes popped open. I immediately grabbed a big stick and started heading up the mountain, yelling for Kendal and Keegan all the way up (you really never know how many monkeys can be up there and after the mean baboons of Africa I didn’t want to take any chances). There was no response for what seemed to be forever so I obviously began to get nervous. 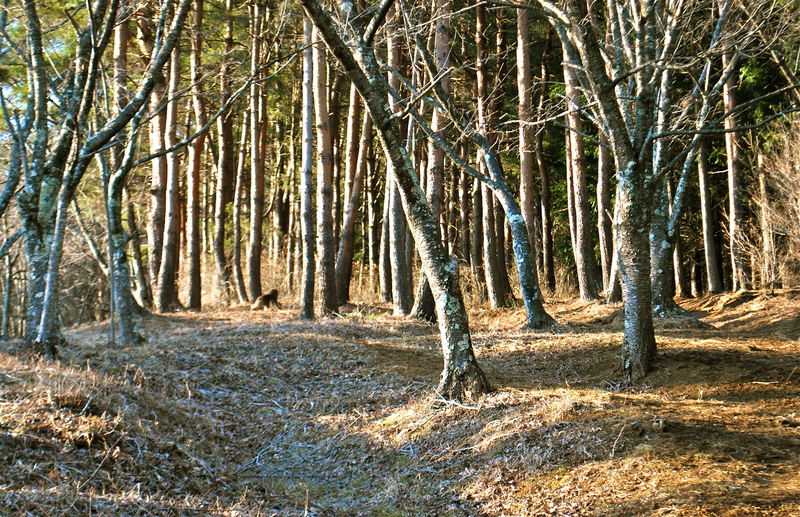 I found myself alone in the middle of the woods now with heavy brush, I could hear or see no one at this point, my heart was pounding . . . very eerie feeling for about 4 minutes and then luckily they both appeared. Since they were on the other side of the mountain top they never heard me yelling and once I told them we saw monkeys they both grabbed sticks and starting hauling down the mountain. On our way to Churei-toh Pagoda we caught some locals playing a game of what looked to be bocce ball. There it is, the picture everyone goes up for – now just imagine the trees to the left full of cherry blossoms – it was magnificent! 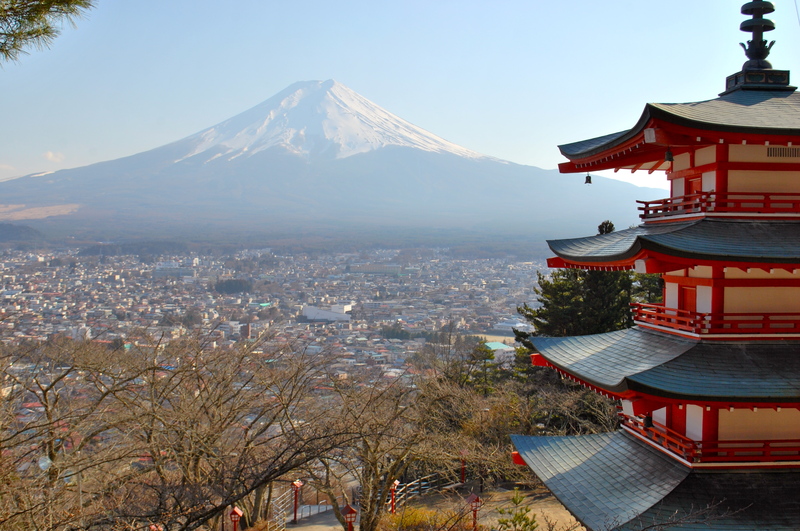 When we started our trip last June Amy and I had no intention of going to Australia but as we sat there looking at Mount Fuji we decided that if we could find some fairly cheap tickets we would visit Australia after Japan. Not sure how that happened but I’ll never forget sitting there looking at that view with Amy and making that decision. We did find cheap tickets the next day, so Australia here we come! Mount Fuji was well worth the trip!